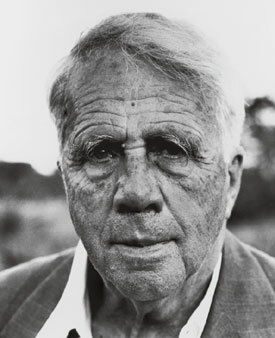 "People who read me seem to be divided into four groups," Robert Frost summed himself up in 1958, when he was already in his mid-eighties and concluding an extraordinary career as the most popular poet this nation has yet produced. "25 percent like me for the right reasons; 25 percent like me for the wrong reasons; 25 percent hate me for the wrong reasons; 25 percent hate me for the right reasons. It's the last 25 percent that worries me." I came of age at a time when Frost's reputation seemed already to belong to the past. One could relegate the old man to a status at once literary and historic: a regional New England poet writing of a farming world long since in decline. It was a world that seemed to have little to do with the mean streets of New York City and the sprawling, freshly minted suburbs of Long Island, places where I grew up in the 1940s and 1950s. When my family moved from a New York tenement to Levittown 50 years ago, I watched the last of the old potato farms, along with their houses and barns, go under month after month to omnivorous bulldozers, to be rapidly replaced by thousands of Cape Cods and ranch houses. By the time I graduated from high school in 1958, Frost had long been apotheosized into the best-known American poet in our high school curriculum. Everyone had by then at least heard of him. I can still recall the blue-backed textbook from my sophomore English class in which I read Frost's "Birches" with interest, especially the poem's description of trees bent by the long weight of snow, their tops trailing the ground like girls washing their hair. Even my father, who had grown up in New York's Little Italy, could quote a few lines of Frost. When I went on to college, Frost had to contend in my imagination with the modernists, whom until then I had not read in any systematic way. Frost now jostled with Yeats, Stevens, Pound, Eliot, Marianne Moore, Williams, and Hart Crane, as well as with the younger poets who had come into their own since the war: Dylan Thomas, Auden, and the Beats. Much of Frost's understanding of the human condition and his view of the vast, indifferent universe did not register with me. I, like many others, mistook his shuttlecock humor and slippery irony for solid ground. I figured that if the woman in the clothing store and my garrulous local postmaster could think of Frost as the best poet they'd ever read, how good could he really be? Besides, I could understand Frost. Good poetry, Empson, Tate, Eliot, and Pound had drilled into me, was difficult. Good poetry meant far-reaching metaphor and classical allusions that required two-inch footnotes, the more the better. Good meant Greek tags, Sanskrit, Provençal, Li Po, Propertius, Flaubert. Good was the free verse revolution, begun by Whitman and continued by Williams and Ginsberg until by sheer volume it had far outpaced formal verse in America by a ratio of 10 to one. By the mid-1960s everyone, it seemed, had come over to the side of free verse. Only a handful of Americans seemed to write in rhymed forms anymore, a scattering of tall pines that had not yet succumbed to the tsunami. I wrote my dissertation on the self-effacing Jesuit Gerard Manley Hopkins, who underwent a kenotic emptying of the self. Frost—skeptical, self-questioning, self-lacerating— belonged to a different universe. He thought hell was a half empty auditorium. In 1968 I began teaching at the University of Massachusetts in Amherst. I was in Frost's landscape of maple and birch and tobacco barns, the New England that had provided a familiar place for so much of our classic American literature, from Anne Bradstreet, Emerson, Hawthorne, Melville, and Dickinson to Lowell, Wilbur, Plath, and Sexton. Frost had once procured a very sweet deal with Amherst College, just down the road from UMass, where he taught the odd class but mostly propounded to packed houses. At UMass, I taught the American modernists, and became absorbed in the work of a poet about whom I then knew almost nothing: Dr. William Carlos Williams of Rutherford, New Jersey. Neither Frost nor Dickinson, the two Amherst presences, spoke to me in the way Williams and his epic, Paterson, did. Paterson, that New Jersey mill town fifteen miles west of the George Washington Bridge, had been a second home to me growing up. My relatives still lived there. My Swedish grandmother had worked there, my Polish grandfather had served as postmaster of Singac after returning, gassed, from the trenches in France, and my mother had been born in Clifton, which bleeds into Paterson. I had swum in the golden upper reaches of the Passaic under a canopy of maples. "The filthiest swill-hole in all Christendom," Williams had christened Paterson, yet he spent his lifetime dreaming and writing about the place. Thirty years ago, Williams and the American idiom and the variable foot seemed to me at odds with what Frost was after. Frost (and his Gardiner, Maine, neighbor Edwin Arlington Robinson) were the last proponents of formal verse, the successors of Wordsworth and Shelley, Browning and Tennyson. I thought of Frost as a pre-Cubist. He had not shattered the surface. For the most part he did not call attention to his liftings and borrowings from the classical and Romantic traditions. He shaped well-made poems that seemed to explain themselves without the need of academic instructors, like me. Williams at that time was like found gold, his measure not yet taken except by a handful of poets like Ginsberg, Lowell, Berryman, and Creeley. He was part of a literary line that included Pound, Gertrude Stein, Marianne Moore, Hart Crane, and Louis Zukofsky. He was part of an artistic line that included Cézanne, Juan Gris, Braque, and Picasso. These lineages certainly did not include Frost, who had summarily dismissed Williams as the writer of only "pips of poems," such as "The Red Wheelbarrow." But Williams and Frost have more in common than I then realized: an intense interest in the nature of the poetic line and in the way the spoken voice rides across the line, setting up a musical counterpoint. In Williams's case this is achieved by his phrasing—his New Jersey speech—with the shadow of the pentameter behind it. In Frost's case it is achieved by a strong medial caesura that provides a signature tone, a kind of overriding idiomatic phrasing that we hear over and above the words themselves. This common music is a subtle thing, like language itself, often invisible or only semitransparent. Both poets possessed it, and each managed to make the American idiom his own. The poems of both are filled with men and women. In Frost, the people are farmers and country folk (though in his letters he reveals his wide reading and travels and his ability to catch the nuances not only of New Hampshire and Vermont but also of New York, California, and Virginia). In Williams, the people are the residents of northern New Jersey: of East Rutherford, Passaic, Garfield, and Paterson. Many of them are his patients. But in Williams you also hear the voices of Greenwich Village, Sutton Place, and Harlem. And there are, in addition, the immigrant accents of the Italian-Americans living south of him and the Norwegian-American accents of his wife's relatives. There is a certain breathlessness, an exclamatory mode in Williams when he sees something with a kind of Zen clarity. Williams really did catch the quotidian in this way, as if all creation were a constant surprise, unfolding before us in ways that were small Emersonian miracles. In Frost, there is a kind of down-home, subtly New England, dry and ironic voice, a half playful, half defensive mode that often hides an underlying insecurity and even fear, of which I think Frost himself was aware. You hear this self-parodic voice in Frost's less successful talky poems and masques, sometimes in his letters, and often in his jokes before a packed auditorium, a way of simultaneously entertaining and keeping at bay a mob of strangers. Not surprisingly, most of the poets who have written about Frost have been in the formal tradition, not in the free verse camp. Ezra Pound is one of the exceptions. In London in 1913, at the very beginning of the poetic revolution, Frost came to Pound with hat in hand. Pound, Frost's junior by 11 years, had influence with the British literary establishment, and Frost, who did not, was hoping for a decent notice from a fellow American. Pound managed to come up with a formulation that both appeased and enraged Frost: "Another American, found, as usual, on this side of the water, by an English publisher. . . . It's the old story." Frost's first book, A Boy's Will, was, Pound noted, raw and filled with infelicities, yet it smacked of the New Hampshire woods. Where Pound most liked Frost seemed to be where Frost sounded most like him. About Frost's second, groundbreaking volume, North of Boston, perhaps his finest book, Pound wrote that Frost could be likened to Jane Austen, in the sense that both portray backwater worlds. He compared this provincial focus to that of the cosmopolitan Stendhal: "Professors to the contrary notwithstanding, no one expects Jane Austen to be as interesting as Stendhal. A book about a dull, stupid, hemmed-in sort of life, by a person who has lived it, will never be as interesting as the work of some author who has comprehended many men's mannners and seen many grades and conditions of existence. But Mr. Frost's people are distinctly real. Their speech is real; he has known them. I don't want much to meet them, but I know that they exist, and what is more, that they exist as he has portrayed them." This was exactly the kind of comment that made Frost distrust Pound for the rest of his life (although Frost would be instrumental 50 years later in getting Pound released from St. Elizabeth's Hospital for the Criminally Insane). It was also the kind of comment that would have infuriated Williams, guilty of the same so-called provincialism. Pound singled out for special praise in North of Boston "The Death of the Hired Man" (calling it "perhaps the best" poem in the book), and parts of "The Housekeeper," "Mending Wall," and "The Black Cottage." He said nothing at all about "Home Burial," which is for many Frost's signature poem. Surely "Home Burial" owes a great deal to the loss of the Frosts' own child, their firstborn, a boy who died of cholera just short of his fourth birthday in 1900, when Frost and his wife were in their mid-twenties. Frost managed, a dozen years after the event, to tell the story with the detachment of a Greek tragedian. My words are nearly always an offense. But two that do can't live together with them. The wife responds not with words but by moving the latch of the front door, as if preparing to spring free of a trap. The husband feels she is overwrought and that she has succeeded in wedging the child's death between them like a knife. He tries again with words, and again he fails, but at least now he has released in her a tirade of words instead of the silence that has grown up around the fact of the child's death. "If you had any feelings," she comes back at him, and now we see what she has been harboring against her husband all this time: the image of his making the dirt around the child's grave leap through the air while the child lay in his little coffin. Outside there in the entry, for I saw it. The husband stands condemned by his own wife, the shovel that dug the grave the awful instrument by which he has committed the unforgivable sin, a transgression he had not known until this very moment he had committed. With what economy and precision Frost gives us the two voices, each with their own complex way of understanding, each with the full force of emotional truth on their side and this terrible loss between them, the loss of the one who should have been the guarantor of love between them. No wonder poets like Randal Jarrell, Seamus Heaney, and Joseph Brodsky have come back to this poem, finding in it the stuff of which indelible dramatic poetry is made. Something, perhaps, about the lack of sound . . . .
After all, poetry means work, means "earnest love," means facts, the particulars of existence, the thing seen, a thing made of this and this and this. It means a plan unfolding line by line, row after row, containing the surprises poetry brings in its very making: the "feeble-pointed spikes of flowers / (Pale orchises)," and that narrow fellow in the grass, "a bright green snake." The long scythe in Frost's double economy makes hay for the farmer as it does for the poet. Frost's "we" and "our" are not as inclusive as Whitman's but, says Walcott, are "something as tight and regional as . . . a Currier and Ives print, strictly New England in black and white." There is also Frost the scrapper, Frost the cantankerous, jealous for his prerogatives, reminding Archibald MacLeish and John Berryman and Williams and others that there could be only one heavyweight in the ring at a time, in poetry as in boxing, a sport Frost loved. Consider Berryman's meeting with Frost at Bread Loaf in the summer of 1962, when Frost let it be known that Berryman—like Williams before him—had a reputation as a womanizer, making Berryman's poetry suspect. The younger Berryman, who was even then assembling his knockout Dream Songs, paid the proper obeisance, letting Frost know he was still top dog. After that, the two men got along well enough. —while he begins to have it out with Horace. In his quiet, blank-verse sonnet, "Robert Frost," Robert Lowell recalled a visit to Frost at his home in Cambridge in the late 1950s, prior to one of Lowell's manic episodes. "Frost at midnight," the poem begins, Lowell slyly linking Frost with Coleridge's poem of that name. The two poets are alone, "the audience gone / to vapor," the whole edifice of the public Frost for the moment "laid on the shelf in mothballs." Lowell confesses to Frost that "he feels too full of himself," and Frost warns him what such afflatus and fame as he himself had enjoyed finally came down to: his inability to help his daughter and to stop his son from killing himself. Lowell, not yet understanding, repeats: "Sometimes I'm so happy I can't stand myself." Frost, resignedly, echoing Wordsworth's "Surprised by Joy," says "When I am too full of joy, I think / how little good my health did anyone near me." Joseph Langland, the poet, told me a story that gives us a picture of Frost in his sixties. It's a particularly haunting image for me because I spent a summer, while teaching at Bread Loaf, living with my family at the Homer Noble Farm. I felt Frost's presence there palpably, especially in the middle distance between the house and Frost's cabin, where so many poets and teachers had come over the years to see him. In the summer of 1940, John Crowe Ransom, the poet and proponent of the New Criticism, was teaching at Bread Loaf. Langland was 23 and an Atlantic Monthly scholar there. One day Ransom asked Frost if he could bring two young poets— Langland and David McDowell, later William Carlos Williams's publisher—over to the Noble Farm to meet him. Frost told Ransom to bring them over after dinner. Ransom, like the southern gentleman he was, arrived in suit and tie, only to find the 66-year-old Frost outside, dressed in overalls, waiting for them with a bat and a couple of softballs. In those days there was a barn off to one side of the house, with an old manure pile in front of it, covered with weeds. Frost told the two young men to get out in the field, then stationed Ransom closer in, in front of the manure pile. For the better part of an hour, Frost batted while the other men fielded. Most of the balls bounced out to Ransom, who had to wade into the pile several times to retrieve a ball. By the time Frost finished batting, Ransom had taken off his suit jacket, loosened his tie, and rolled up his shirtsleeves, and he was sweating. As dusk descended Frost shrugged. Too late, he barked, for anyone else to bat. With that, he invited the men into the darkened house. Inside, he lit a Coleman lantern (there was no electricity then) and invited his guests to sit in the kitchen. Ransom mentioned that Langland and McDowell had each brought a poem to read, if Frost would care to listen. Frost mumbled his assent. After Langland read, there was an awkward silence, punctuated only by the creak of kitchen stools. At last, Frost muttered a noncommittal acknowledgment. Then it was McDowell's turn. He had been a student of Ransom's at Kenyon and had been trained in the New Critical method of writing poetry. Nervously breaking the silence that followed his reading, McDowell began explaining the way he had used enjambment, varied caesurae, a double set of metaphors, and irony in the long, complex poem. As McDowell went on, Frost's right hand slowly rose in time with the explanation, until at last his arm was level with his head. Then Frost brought his hand down. "Careful, young man," he said, "or you'll say a better poem than the one you wrote"—no doubt a wry comment on the New Criticism that Ransom had helped invent. A final image. I imagine the young Frost, his name still unknown to the larger world, writing by lamplight in the middle of a winter night in a farmhouse in southern Vermont. His wife and his children are asleep, the chores are done, the house is silent except for the creak of wood and the sound of the wind. He has been writing a long poem, but now, suddenly, he feels the stirrings of a lyric. The lamplight flickers across the page, and mercifully, like some unbidden grace, comes first one line and then another. He begins wryly: "Whose woods these are I think I know." For who, really, owns the woods, except for the darkness and the elements? And then he is off, with a playful couplet to warm himself against the cold: "His house is in the village, though." A third, unrhymed line comes, cutting across the play of the initial rhymes: "He will not see me stopping here." Then the initial rhyme picks up again, bracketing and end-stopping the stanza with its muffling oblivion: "To watch his woods fill up with snow." A form—aaba—is repeated in each successive stanza and is resolved only in the last. There is a sense of mystery and mastery, of serious play, a resonance, a small narrative drama that moves into the high lyrical register of a line like "Of easy wind and downy flake" before it settles back into the repeated last line: "And miles to go before I sleep." It is a devilishly simple line, one that over the intervening 75 years has raised as many questions as it has answered. These lines, with their subtle iambic clip-clop, have, like so many other lines of Frost, proven impossible to dislodge. Paul Mariani is a professor of English at Boston College, a past National Book Award nominee, and a frequent contributor to BCM. This story was adapted from his new collection, God and the Imagination: On Poets, Poetry, and the Ineffable, � 2002, University of Georgia Press.